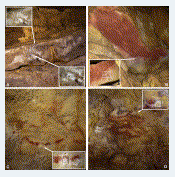 The prestigious North American Journal of Archaeological Science has published an article on-line (its printed edition is anticipated shortly) which proves that the first stages of palaeolithic art in the cave at Altamira (Santilla del Mar, Cantabria, Spain) were effected by the first groups of Homo sapiens to settle in Europe and that these artistic samples were carried out over time, at least over a period of 20,000 years (between at least 35,000 and 15,200 cal years B.P. ), thus implying that they are in fact older than previously thought. Also demonstrated is the high symbolic value that the Altamira cave had for palaeolithic groups and the reuse and the gradual symbolic integration of the motifs previously existing in each one of the new stages of construction of the sanctuary. Altamira was thus a reference, a ‘sanctuary’, a place of repeated visit during the Palaeolithic. Thus, the results obtained from the figures adorning the roof of Altamira allow us to affirm that, on the basis of the data of the cave art and its occupations, the spatial distribution of the artistic works and their relation with the domestic layout of the cave affirm a close cultural link between the symbolic space, associated with surroundings of darkness/shadow, with this domestic space, associated with an illuminated environment. “Obtaining such old dating from the Roof of the Polychromes, close to 35,000 years old or more, allow us to affirm that the living spaces used by people in Altamira were only metres away from where they carried out their symbolic activity, both activities coming to live side by side in time, at some point between 36,000 and 20,000 years ago; burying the traditional idea that the symbolic-religious ambit occurred in the darkness of the cave and everyday life was in the open air or at the entrance of the cave. In this manner, an important part of the art at Altamira, and the symbology and beliefs underlying it, was not just something private, but linked to everyday life, to the human group”, explained Marcos García Díez, lecturer in the University of the Basque Country (UPV/EHU) at the Department of Geography, Prehistory and Archaeology, and member of the Consolidated and High Performance Group in Prehistory of the Basque Government. The research was undertaken by a multidisciplinary team of chemists and archaeologists, led by this UPV/EHU Group and made up of the Museum and Research Centre at Altamira Cave, the National Centre for Research on Human Evolution in Burgos (CENIEH), the University of Barcelona (ICREA), and the Universities of Bristol and Southampton, both in England. The research involved uranium-series dating, not of the paintings themselves, but of the crusts of calcite found above and below these painted figures. This novel method has no limitations imposed by carbon-14 AMS, frequently used in archaeological dating and only applicable to a small number of rock art figures painted with organic material. Thanks to the uranium-series dating procedure, the conservation of the paintings is not prejudiced as it is not necessary to extract coloured material from any of the pictures; a small amount of calcite being sufficient to carry out the analysis. As a consequence, it does not affect the rock art, as does dating with carbon-14 AMS and, therefore, its integrity is guaranteed. The rock art in Altamira Cave was the first ensemble of Palaeolithic parietal art to be identified scientifically (Sautuola, 1880). Due to the great thematic, technical and stylistic variety of the art in the cave, which constitutes one of the most complete Palaeolithic art ensembles, Altamira was listed as World Heritage by UNESCO in 1985. Uranium-series dating has recently been applied to figures on the decorated ceiling in the cave. Several motifs are partly covered by thin layers of calcite precipitates, whose formation process is datable by this method. The results provide the date when the calcite formed, which gives a minimum age for the underlying depictions. These results confirm that the parietal art at Altamira was produced during a prolonged period of time, at least 20,000 years (between 35,000 and 15,200 years ago), and that part of the ensemble corresponds to the Aurignacian period. Fig. 2. 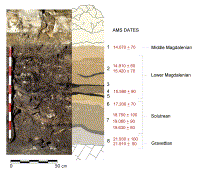 Stratigraphy and AMS chronology (AMS) of human occupation of Altamira Cave.